"In the beginning, there was nothing at all. Earth was not found, nor Heaven above, a Yawning-Gap there was, but grass nowhere." What we know about the origin of the Universe? A planet with a rocky composition and a temperate climate at an intermediate distance from an average star. The Earth is unique in many ways. For example, it is the only body we know of where water can exist in all three phases: vapor, liquid and solid forms. Click on the image for a general tour that is offered through Windows to the Universe. A medium-sized, moderately bright, middle aged star, born ~5 billion years ago from a gaseous nebula, with perhaps another 4-5 billion years to live before expanding to a "red-giant", engulfing the Earth and finally cooling to become a fading "white dwarf" star. This image of today's Sun, as seen in hydrogen emissions that show the turbulent solar atmosphere, is the most recent available from NASA. The birthplace of stars. Our own sun formed in just such a nebula. The example shown here is the Great Orion Nebula, one of the youngest objects in the sky - thought to be less than 20,000 years old. Orion is very hot (about 20,000 K). Other spectacular examples are the Cat's Eye Nebula, and the Trifid Nebula. Star clusters are recently-born families of stars that form in such nebula and then gradually drift apart. Click on Orion and see the Horsehead Nebula, which is 1500 light years away. A "light year" is a unit of distance which represents the distance traveled by light in one year. A collection of billions of stars, held together by gravity. Our own galaxy is known as the "Milky-Way" Galaxy and is 100,000 light years across. Galaxies are in many ways "Island Universes". Each galaxy contains billions of stars, with some having more than 1000 billion stars. This Hubble Space Telescope true-color image is the Cartwheel Galaxy, located 500 million light-years away in the constellation Sculptor. Click on it to see our nearest neighbor galaxy, Andromeda. The visible universe contains at least 100 billion galaxies - these are incredible numbers. This image is of very young galaxies observed by the Hubble Space Telescope at the very limit of its range. The sky is full of such strange looking galaxies in all directions (except where masked by intervening dust clouds). The universe is home to a variety of exotic objects. For example, quasars, which were first discovered in 1960, are still baffling objects. Incredibly energetic, they are found at great distances near what is thought to be the edge of the known universe (the most distant one has been estimated to be 10 billion light years away). Some quasars produce more energy than 100 large galaxies. Some scientists think that quasars may represent holes to other universes. Electromagnetic Radiation includes visible light, radio waves, microwaves, x-rays, gamma rays, and infra-red (heat) rays. All these forms of radiation are characterized by traveling oscillations of a combined electric and magnetic field. These electromagnetic waves differ by the wavelength of the oscillation, with shorter wavelength radiation carrying more energy than longer wavelength radiation. All possible wavelengths make up the electromagnetic spectrum. Where E (lambda) is the amount of radiant energy emitted at a given wavelength, lambda. T is the temperature of the object, and a and b are constants. 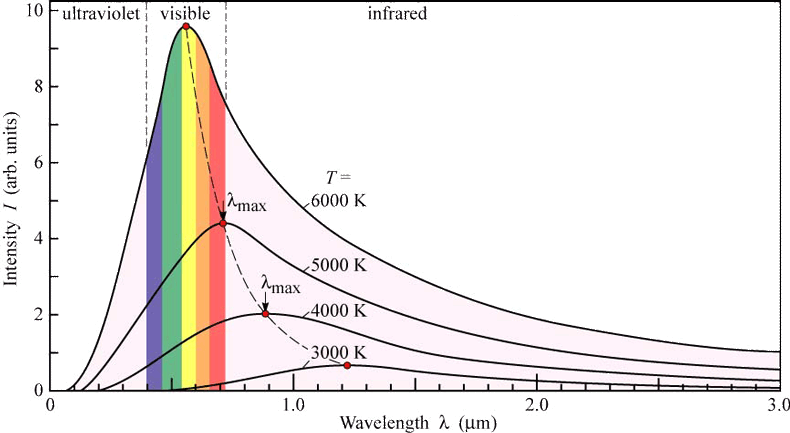 The spectrum of wavelengths emitted by a body at a temperature, T, has a characteristic shape that is strongly dependent on the wavelength (to the inverse fifth power). This law describes the spectral distribution of radiation emitted by a black body. Very hot bodies (3000 - 20,000 K) like our Sun emit a lot of light at visible wavelengths. The Sun acts like a black body near 6000K, whereas the Earth acts like a black body near 300 K (can you guess where its curve would lie?). where E is the total energy emitted (calculated by adding up the areas under the curves of Figure 1), sigma is a constant, and T is temperature. Planck's law gives us the shape of the curves. Stefan-Boltzmann's Law tells us that much more energy comes from the Sun than from the Earth. Wein's law tells us that the hot Sun is much bluer than the cooler Earth. The Doppler effect shifts the light to longer wavelengths (red shift) for a receding object, and to shorter wavelengths (blue shift) for an approaching object. Click here to see how the speed of an object affects wavelength. The Big Bang theory states that the Universe began when primordial mass exploded. This fireball gradually cooled as it expanded outward, and giant clouds of swirling gas formed the celestial bodies. The Big Bang theory does not explain why the bang occurred, but predicts (with surprising accuracy) what the consequences of the event. If the big bang occurred, the initial temperatures must have been so unimaginably high that matter could only have existed in exotic and unstable forms. As the temperature cooled in the first second, free hydrogen nuclei (atomic mass 1) were formed that could undergo fusion reactions to give heavier forms of hydrogen (atomic mass 2, 3) and helium (atomic mass 3 and 4). Thus, the theory predicts a early universe with only a mixture of ~75% hydrogen and 25% helium (by weight) and no heavier species. This ratio is exactly what is observed in stars. Measurements of the red shifts of virtually all galaxies (except a few in our immediate vicinity) show that the visible universe is expanding in all directions. The constant of proportionality between the distance and velocity of recession is known as Hubble's constant. Measurements of low energy microwave radiation show that the visible universe is permeated by "cosmic background" microwave radiation, coming from all directions and similar to what is expected from a black body at 3K. The Big Bang theory predicts that such radiation is the red-shifted remnant of the radiation released when matter and light became decoupled about 1 million years after the Big Bang. The American scientists who first made this measurement in 1965 (Penzias and Wilson) obtained the Nobel Prize. 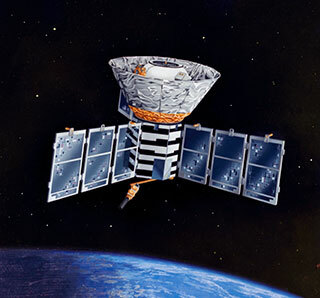 Measurements from the NASA Cosmic Ray Background Explorer (COBE) mission provide additional support. COBE satellite results show that the cosmic ray background is not completely uniform in direction (see Figure), but that there is some clumping in preferred directions with differences in effective temperature of only one hundred millionth of a degree. This clumpiness would have been necessary for the big bang to produce galaxies, since a perfectly uniform explosion would not produce localized high densities. 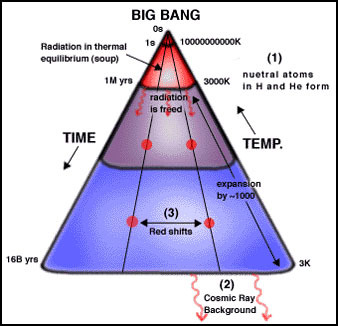 A timeline for the Big Bang model of the Universe. At ~1 million years after the Big Bang, temperatures cool sufficiently to allow hydrogen- and helium-neutral atoms to form from the plasma (charged particles). This event freed up radiation that was previously contained in thermal equilibrium with matter. Since then, radiation and matter have gone their own ways. When astronomers observe the cosmic ray background, they are looking at photons released from the big bang when radiation and matter became uncoupled.